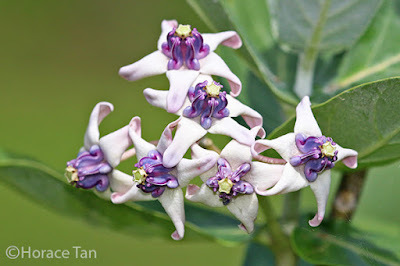 This 6th instalment of our Butterflies' Larval Host Plants series features the Crown Flower (Calotropis gigantea), a species from the Apocynaceae family (commonly known as the dogbane family) which has many members possessing the ability to exude milky latex/sap. 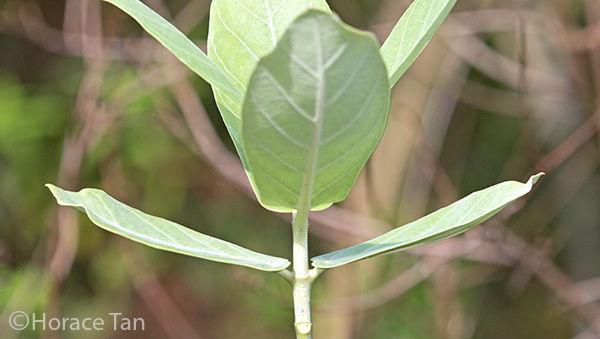 Many of these plants are known to be poisonous. Leaves of the Crown Flower. The Crown Flower is native to South Asia, Southeast Asia, China and tropical Asia. In Singapore, it is typically cultivated in gardens to attract a variety of insects. Wild specimens of the Crown flower are rarely seen. 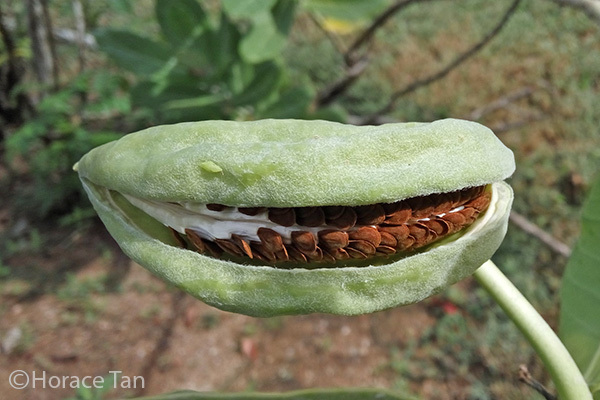 All plant parts of the Crown Flower have an abundance of milky latex, and will "bleed" easily when the plant part is cut or scratched. 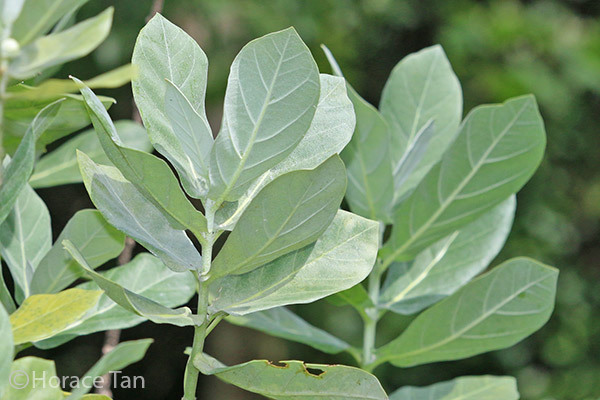 It is considered a poisonous plant as its milky sap has been found to cause a reversible vision loss and skin irritation, and even death when ingested. Even so, the Crown Flower is also a traditional medicinal plant and extracts from various plant parts have been used in treatment of many conditions such as syphilis, sores, ulcers and boils etc. Larval Host for Butterfly Species: Danaus chrysippus chrysippus (Plain Tiger). 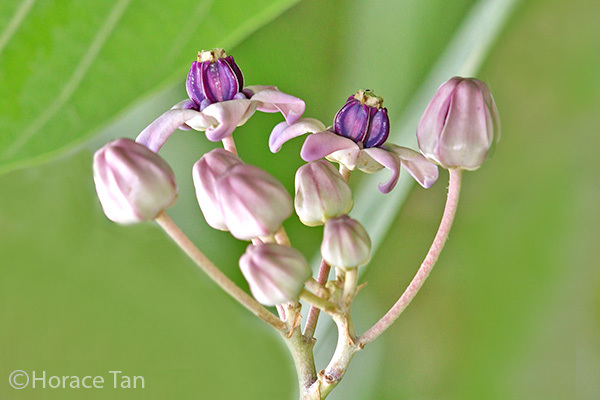 Crown Flower plants found in parks in Singapore, showing the upright stem and the large, oval-shaped leaves. The Crown Flower is a medium to large evergreen shrub, growing up to a height of 3-4m. 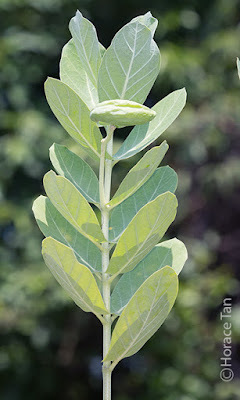 The leaves are simple, opposite, fleshy, obovate in shape. 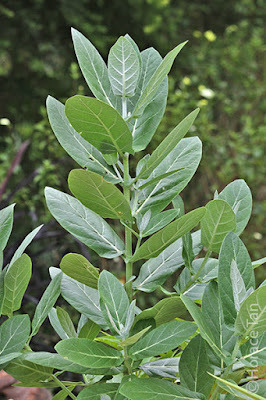 Young leaves are densely woolly, giving a whitish appearance. A view showing the simple and opposite arrangement of leaves of the Crown Flower. A pair of very young leaves showing the woolly appearance. The top view of another pair of more mature leaves which still have the woolly appearance on the upperside. Fully grown leaves are large and can be 10-20cm in length, 6-12cm in width. The upperside is light green and the underside whitish green. 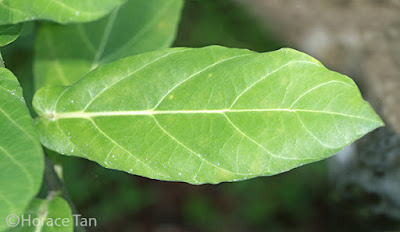 The leaf base is deeply heart-shaped, and the petiole is relatively short. The underside of a mature leaf. 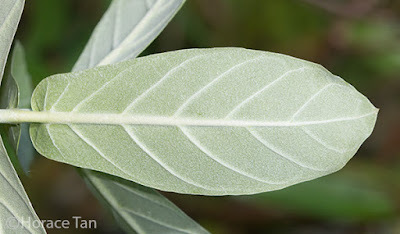 The upperside of a mature leaf. Flowers of the Crown Flower occur in axiliary clusters. 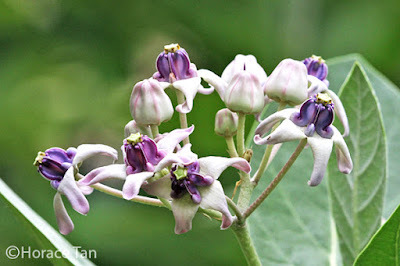 Each flower is about 3-4cm wide, white or pale lilac-blue. Each has five pointed petals and a small "crown" rising from the center. These flowers attract a variety of insects such as bees and butterflies which act as pollinators in the reproduction process. In some countries, the flowers are used in floral arrangements due to their long-lasting property. A cluster of white flower buds. 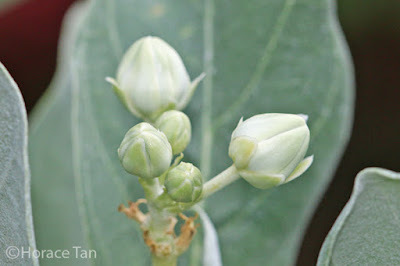 A cluster of the lilac flower buds. A cluster of flowers, white variety. A cluster of flowers, lilac variety. 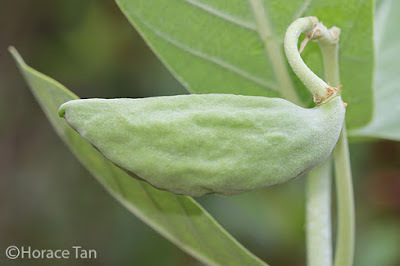 Each fruit of the Crown Flower is a large, green inflated pod, curved on one side and 6 to 10cm in length. 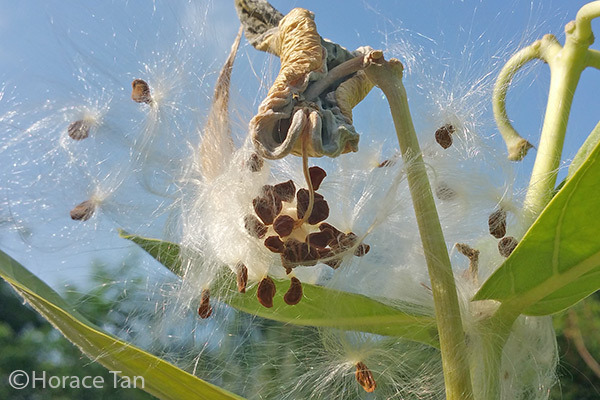 When mature, it splits open to expose the many seeds packed within. 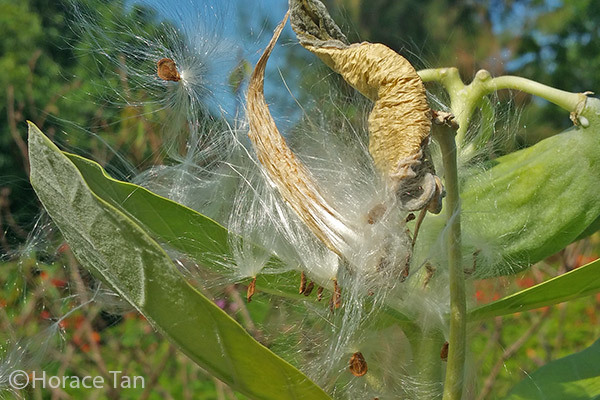 Each brown seed is flattened and broad, with a tuft of whitish hair 2 to 3cm long. A fruit of the Crown Flower. A fruit of the Crown Flower, split to reveal the brown seeds. Seeds of the Crown Flower next to the mature fruit, waiting for the next breeze to take them along. Another view of the same group of exposed seeds. In Singapore, the Crown Flower also serves as the larval host plant for one butterfly species: Danaus chrysippus chrysippus (Plain Tiger), a species in the Danainae subfamily of Nymphalidae. A Plain Tiger taking nectar from the flowers of the Snakeweed. 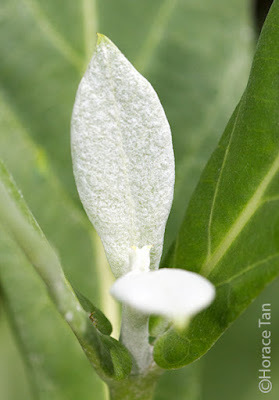 An egg of the Plain Tiger laid on the underside of a leaf of the Crown Flower. 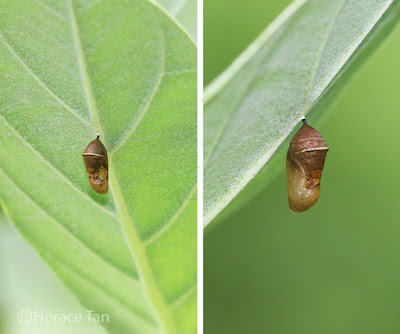 Eggs of the Plan Tiger is laid singly on the underside of a leaf of the Crown Flower. 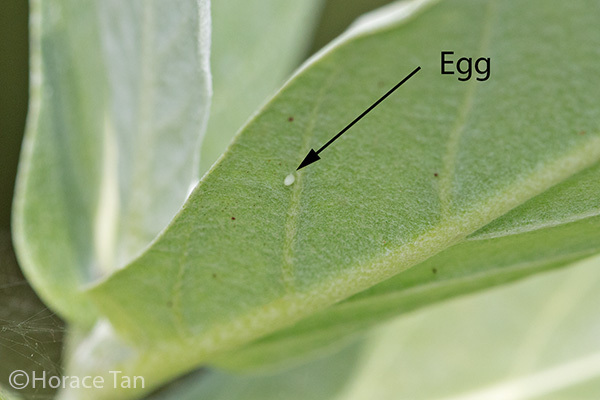 Due to the large size of the leaf, at times more than one egg can be found laid on the same leaf. The life cycle of the Plain Tiger is fast paced throughout. 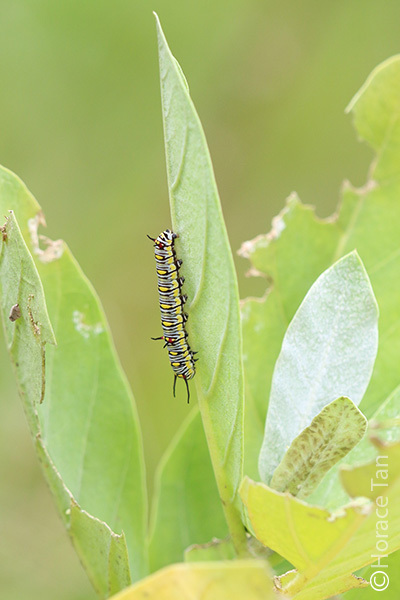 The Plain Tiger caterpillars feed on the lamina of the leaf of the Crown Flower. They stay on the underside of the leaf when eating and resting between feeds. 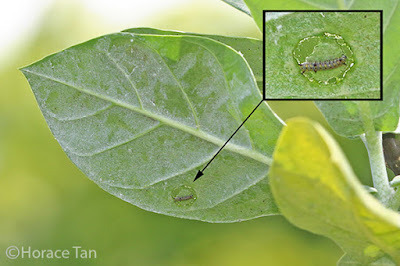 In the earlier instars, the caterpillar has the habit of marking out a circular patch on the leaf, before devouring the patch. 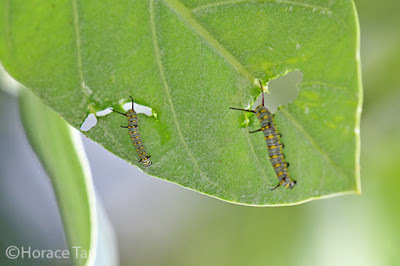 The milky sap excreted in the process appears to have no effect on the caterpillar. 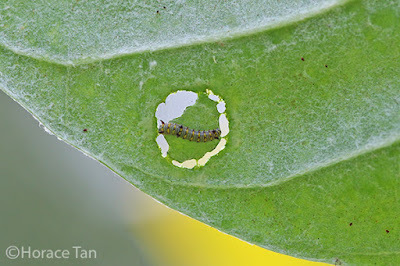 A early instar caterpillar of the Plain Tiger resting within its circular patch of territory. Another early instar caterpillar part way through devouring the circular patch of lamina. 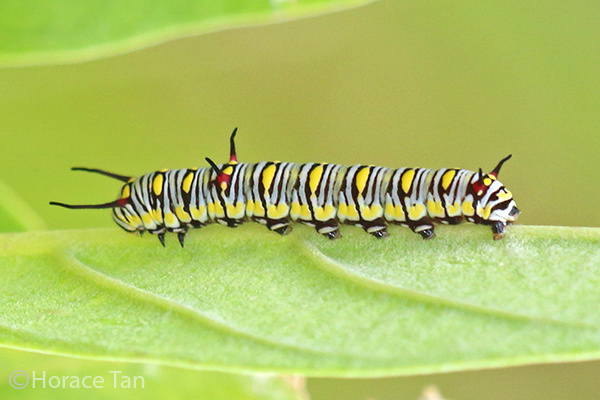 In later instars, the caterpillar will simply eat through the lamina away from the leaf margin or eat along it. A pair of late instar caterpillars of the Plain Tiger feeding on the underside of the same leaf. A final instar found resting on the underside of a leaf in an Eco garden. Close-up view of the same caterpillar. 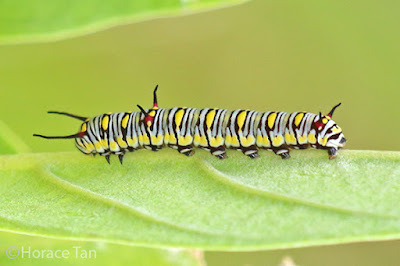 Typically, the Plain Tiger caterpillar will pupate on the underside of a leaf of the Crown Flower. The pupation site is usually on the raised mid-rib of the leaf. 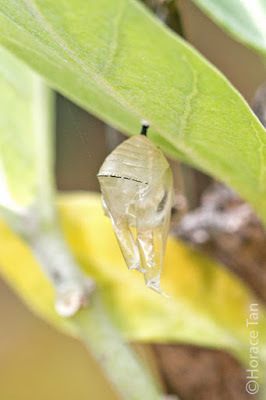 A pupa of the Plain Tiger found in an Eco garden, possibly parasited. An empty pupal case of the Plain Tiger on the underside of a leaf of the Crown Flower, indicating that another adult has made it. 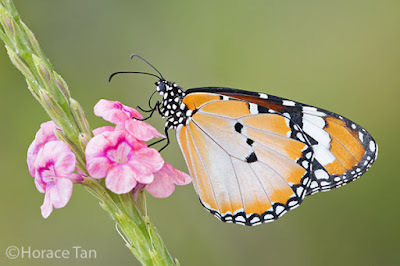 A walk in a garden where the Crown Flower is planted will usually come with a sight of the Plain Tiger butterflies fluttering around in the vicinity. 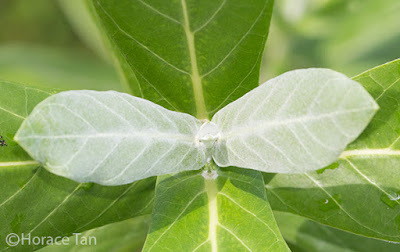 If this is the case, it will be rewarding to examine the leaves for any foliage damage and the presence of the beautifully coloured caterpillars of the Plain Tiger. 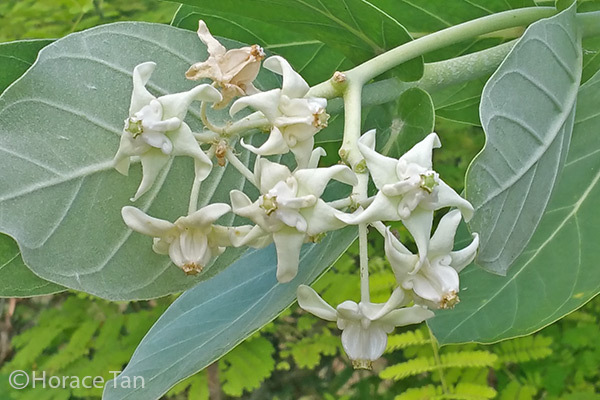 Calotropis gigantea -DNA, Lee Kong Chian Natural History Museum - .